If you are planning to end the year in the best way possible, on one of the most popular beaches in the Riviera Maya, and you want to know what to do in Cancun to enjoy it to the fullest, keep reading. One of the things that characterizes the beauty of this destination is the flora and fauna, the ocean’s color, the softness of the sand and plenty of incredible things you can see only by snorkeling or diving. If you would like to dive, you can do so even though you have never done it before, and this is the perfect scenery to learn and practice. For those more experienced, there are tours that allow you to know the very best of the Caribbean depths. To practice snorkel, it is not necessary to be certified or to be a professional, all you need is to know how to swim and you can visit one of the most original museums in the world: The Subaquatic Art Museum. 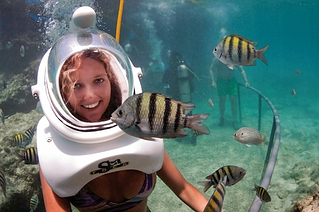 Among all the activities in Cancun, this is definitely one to do. Can you imagine seeing the depths of the sea while walking underwater? This is possible with the Sea Trek Program at Xcaret, thanks to special equipment you can see everything around you without limits. 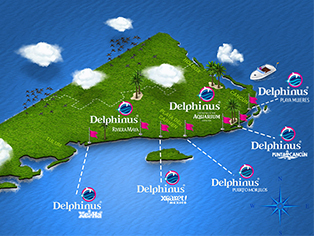 Tourists from all around the world visit the Caribbean to swim with dolphins in Mexico. Here, the options to live a close experience with marine species are almost unlimited, and we don’t want you to miss this on your next vacations. Besides, there are many natural habitats where you can do it: Xcaret, Xel-há, Puerto Morelos, Hyatt Zivá or the Interactive Aquarium of Cancun; as well as many different kinds of interactions. So, all you need to do is convince yourself to live a unique swim with dolphins in Mexico. If getting wet is not your thing, maybe sailing is for you. There are several options: you can do it on the Nichupté Lagoon, in the mangroves, or while enjoying an incredible sunset. When you ask yourself what to do in Cancun, remember this amazing activity. Many people say that parasailing offers the best views of Cancun. You will be lifted 80 meters high, however, among all the activities in Cancun this is only for the braver ones who really dare to do it. This is the most audacious activity that we will be recommending today. Even though it seems like more of an air activity than an aquatic one, what makes it so special is that you will be flying over the ocean of Isla Mujeres or the Nichupté Lagoon, appreciating the different colors of the Mexican Caribbean Sea. Now you have plenty of ideas of what to do in Cancun. If you are thinking of aquatic activities, you can sail, swim with dolphins in Mexico or practice parasailing over the Caribbean Sea. Book in advance and find very attractive discounts.